Friday, 19 October 2018, 4:10p.m. Prime Minister Jacinda Ardern's partner Clarke Gayford has released never-before seen photos of the moment NZ First Leader Winston Peters picked Labour as his Coalition Government partner. 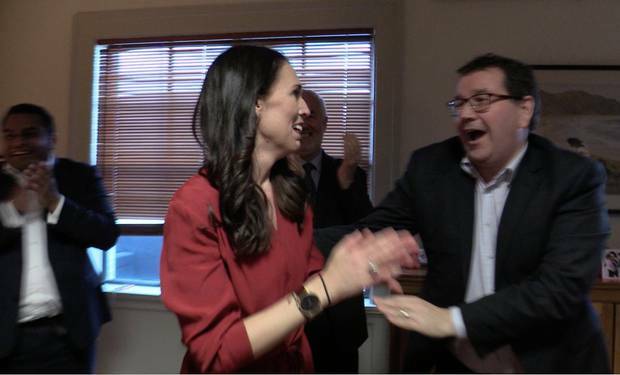 The photos show Ardern and Finance Minister Grant Robertson waiting in anticipating for Peters to make his announcement – then the look of jubilation after the decision was public. It was a year ago today Peters announced his decision. "A year ago today [Winston Peters] made a bold call that changed EVERYTHING. We watched on TV like everyone else, except I pointed a camera the other way," Clarke said on Twitter. "What an incredible year it has been, what a year ahead. Welcome to the ride." Also in the photos are Commerce and Consumer Affairs Minister Kris Faafoi and Labour Party President Nigel Haworth – both shown clapping in delight. A spokesman for the Prime Minister said these are the first public photos from within the room. They were taken in the leader of the Opposition's office. Ardern made reference to this moment in a speech last month. "The night that I stood in my office and waited as the whole nation did, for the now Deputy Prime Minister to make the announcement as to who New Zealand First would form a government with. "Clarke filmed my face," she said. "It's not the most flattering piece of footage. It's fair to say I'm looking a bit anxious. Almost a bit sweaty. "There is a sudden moment of realisation in my expression. It's not the moment where the government is announced, it's before that. It's the moment Winston talks about the things that I believe in too. "I smile, and realise that we are going to have the chance to change everything." Peters announced he would be forming a Coalition with Labour after weeks of negotiations between the two main parties. Later that night, Ardern said it was an "honour and a privilege" to form a Government with NZ First. She said it would be a "partnership" between the two parties and they would learn from each other. Ardern, as well as former National Party Leader Bill English have maintained they learned about Peters' decision at the same time as everyone watching TV.